It's week 41 of the Bloggers Challenge, and this week the challenge was to use the layout on page 65 of the Spring Summer Collection as your inspiration. I had quite a few ideas of what I wanted to make, of course I put this card off until the morning it was supposed to be posted. I played with a few different stamps - but am really happy with the outcome of my finished card. I used my Coluzzle to make the circle on my Afternoon Tea DSP, and added my 1/2" circles to create a scallop look. For my main image, I paper pieced the vase using the Afternoon Tea DSP, the flowers are embossed and water colored on watercolor paper, cut out and attached. Beautiful Lisa, did you and Pat discuss this, lol. 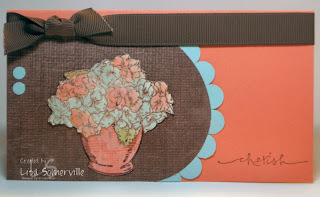 I love the choice of colors and the paper pieced vase is super. Love this. Like this card a lot Lisa, especially the colors you chose!! Flower is gorgeous too! Beautiful! I love that set and you did a wonderful job with the challenge layout. Love your choice of colors - chocolate chip never lets a girl down. :) Great card Lisa! Wow! This is a beauty! Love the colors and that vase of flowers is just gorgeous! What a beautiful card...love that image...so very springlike and fresh. Great job! Great choice of sets -- amazing how the same stamp can look so different! Love your coloring. Beautiful card, Lisa! We both put a scallop edge on our circle(GMTA)...is it just me or is yours quite voluptuous!?! It's a winner! The vase is just too cool, as well as every other little pice of art here! i love the colors on here! The scallops really make it pop! Very pretty. This has a nice soft feel to it. The scalloped border is a nice touch. I definitely like the color combo, Lisa. I thought it was a hard layout...it's fun to see what everyone's done with it though! What a pretty card! The paper pieced vase is great. Lisa!!! Such a wonderful card! Love the circles as your scalloped layer and the paper piecing is wonderful!!! Beautiful!! The colours are Rich and the Flowers Beautiful!! Very pretty Lisa! I love the color combo and the addition of the scalloped edge. I love these colors! It came together beautifully! Great job! GREAT colors - so calming! Cute card Lisa. Love the color combo used. Looks very rich!